However, individual countries within the UK have frameworks for the promotion of their indigenous languages. In Wales, all pupils at state schools must either be taught through the medium of Welsh or study it as an additional language until age 16, and the Welsh Language Act 1993 and the Government of Wales Act 1998 provide that the Welsh and English languages should be treated equally in the public sector, so far as is reasonable and practicable. Irish and Ulster Scots enjoy limited use alongside English in Northern Ireland, mainly in publicly commissioned translations. The Gaelic Language (Scotland) Act, passed by the Scottish Parliament in 2005, recognised Gaelic as an official language of Scotland, commanding equal respect with English, and required the creation of a national plan for Gaelic to provide strategic direction for the development of the Gaelic language. [note 2] There is also a campaign under way to recognise Scots as a language in Scotland, though this remains controversial. The Cornish language enjoys neither official recognition nor promotion by the state in Cornwall. Under the European Charter for Regional or Minority Languages, the UK Government has committed to the promotion of certain linguistic traditions. The United Kingdom has ratified the charter for: Welsh (in Wales), Scottish Gaelic and Scots (in Scotland), Cornish (in Cornwall), andIrish and Ulster Scots (in Northern Ireland). British Sign Language is also a recognised language. The culture of the United Kingdom is the pattern of human activity and symbolism associated with the United Kingdom and its people. It is influenced by the UK’s history as a developed island country, a liberal democracy and a major power, its predominantly Christian religious life, and its composition of four countries—England, Northern Ireland, Scotland and Wales—each of which has distinct customs, cultures and symbolism. The wider culture of Europe has also influenced British culture, andHumanism, Protestantism and representative democracy developed from broader Western culture. British literature, music, cinema, art, theatre, comedy, media, television, philosophy and architecture are influential and respected across the world. The United Kingdom is also prominent in science and technology. Sport is an important part of British culture; numerous sports originated in the country, including football. The UK has been described as a “cultural superpower”, and London has been described as a world cultural capital. The Industrial Revolution, with its origins in the UK, had a profound effect on the socio-economic and cultural conditions of the world. As a result of the British Empire, significant British influence can be observed in the language, culture and institutions of a geographically wide assortment of countries, including Australia, Canada, India, Republic of Ireland, New Zealand, Nigeria, Pakistan, South Africa, the United States and English speaking Caribbean nations. These states are sometimes collectively known as the Anglosphere, and are among Britain’s closest allies. In turn the empire also influenced British culture, particularlyBritish cuisine. The cultures of England, Scotland, Wales and Northern Ireland are diverse and have varying degrees of overlap and distinctiveness. What is your favorite movie? What about the subject? When distinguished from American English, the term “British English” is sometimes used broadly as a synonym for “Commonwealth English“, the general dialect of English spoken amongst the former British colonies exclusive of the particular regionalisms of, for example, Australian or Canadian English. English is a West Germanic language that originated from the Anglo-Frisian dialects brought to Britain by Germanic settlers from various parts of what is now northwest Germanyand the northern Netherlands. The resident population at this time was generally speaking Common Brittonic—the insular variety of continental Celtic, which was influenced by the Roman occupation. This group of languages (Welsh, Cornish, Cumbric) cohabited alongside English into the modern period, but due to their remoteness from the Germanic languages, influence on English was notably limited. However, the degree of influence remains debated, and it has recently been argued that its grammatical influence accounts for the substantial innovations noted between English and the other West Germanic languages. Initially, Old English was a diverse group of dialects, reflecting the varied origins of the Anglo-Saxon Kingdoms of England. One of these dialects, Late West Saxon, eventually came to dominate. 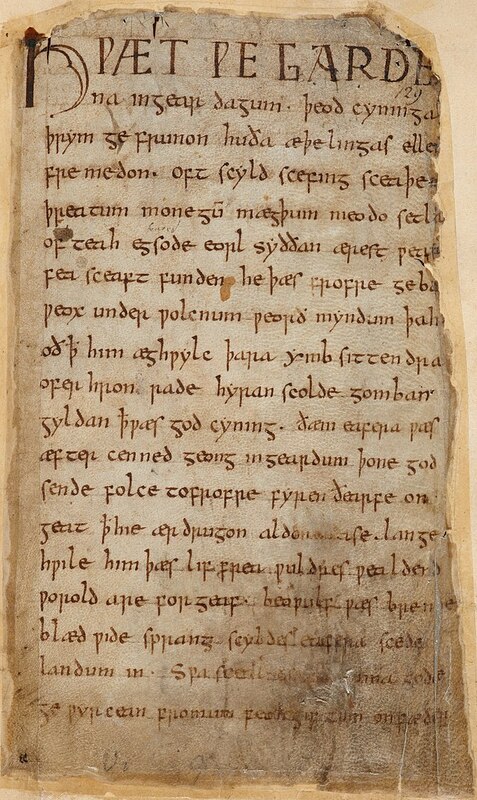 The original Old English language was then influenced by two waves of invasion: the first was by speakers of the Scandinavian branch of the Germanic family, who conquered and colonised parts of Britain in the 8th and 9th centuries; the second was the Normans in the 11th century, who spoke Old Norman and ultimately developed an English variety of this called Anglo-Norman. These two invasions caused English to become “mixed” to some degree (though it was never a truly mixed language in the strictest sense of the word; mixed languages arise from the cohabitation of speakers of different languages, who develop a hybrid tongue for basic communication). The more idiomatic, concrete and descriptive English is, the more it is from Anglo-Saxon origins. The more intellectual and abstract English is, the more it contains Latin andFrench influences (e.g. pig is the animal bred by the occupied Anglo-Saxons and pork is the animal eaten by the occupying Normans). Cohabitation with the Scandinavians resulted in a significant grammatical simplification and lexical enrichment of the Anglo-Frisian core of English; the later Norman occupation led to the grafting onto that Germanic core of a more elaborate layer of words from the Romance branch of the European languages. This Norman influence entered English largely through the courts and government. Thus, English developed into a “borrowing” language of great flexibility and with a huge vocabulary. Dialects and accents vary amongst the four countries of the United Kingdom, as well as within the countries themselves. The major divisions are normally classified as English English (or English as spoken in England, which encompasses Southern English dialects, West Country dialects, East and West Midlands English dialects and Northern English dialects), Welsh English (not to be confused with the Welsh language), Irish English and Scottish English (not to be confused with the Scots language). The various British dialects also differ in the words that they have borrowed from other languages. Following its last major survey of English Dialects (1949–1950), the University of Leeds has started work on a new project. In May 2007 the Arts and Humanities Research Council awarded a grant to a team led by Sally Johnson, Professor of Linguistics and Phonetics at Leeds University, to study British regional dialects. Johnson’s team are[a] sifting through a large collection of examples of regional slang words and phrases turned up by the “Voices project” run by the BBC, in which they invited the public to send in examples of English still spoken throughout the country. The BBC Voices project also collected hundreds of news articles about how the British speak English from swearing through to items on language schools. This information will also be collated and analysed by Johnson’s team both for content and for where it was reported. “Perhaps the most remarkable finding in the Voices study is that the English language is as diverse as ever, despite our increased mobility and constant exposure to other accents and dialects through TV and radio.” Work by the team on this project is not expected to end before 2010. The University of Oxford (informally Oxford University or simply Oxford) is a collegiate research university located in Oxford, England. While having no known date of foundation, there is evidence of teaching as far back as 1096, making it the oldest university in the English-speaking world, and the world’s second-oldest surviving university. It grew rapidly from 1167 when Henry II banned English students from attending the University of Paris. After disputes between students and Oxford townsfolk in 1209, some academics fled northeast to Cambridge, where they established what became the University of Cambridge. The two “ancient universities” are frequently jointly referred to as “Oxbridge“. The University is made up of a variety of institutions, including 38 constituent colleges and a full range of academic departments which are organised into four Divisions. All the colleges are self-governing institutions as part of the University, each controlling its own membership and with its own internal structure and activities. Being a city university, it does not have a main campus; instead, all the buildings and facilities are scattered throughout the metropolitan centre. Most undergraduate teaching at Oxford is organised around weekly tutorials at the self-governing colleges and halls, supported by classes, lectures and laboratory work provided by university faculties and departments. 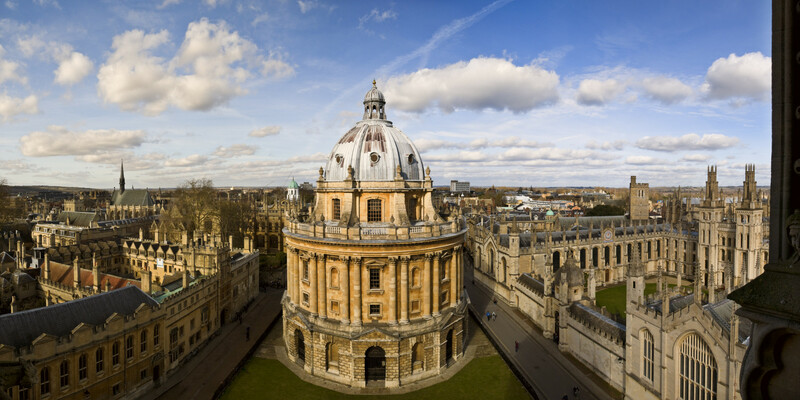 Oxford is the home of several notable scholarships, including the Clarendon Scholarship which was launched in 2001 and the Rhodes Scholarship which has brought graduate students to read at the university for more than a century. The university operates the largest university press in the world and the largest academic library system in the United Kingdom. 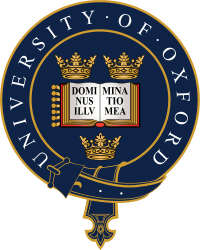 Oxford has educated many notable alumni, including 27 Nobel laureates (60 total affiliations), 26 British Prime Ministers (most recently David Cameron) and many foreign heads of state. The University of Oxford has no known foundation date. Teaching at Oxford existed in some form in 1096, but it is unclear at what point a university came into being. It grew quickly in 1167 when English students returned from the University of Paris. The historian Gerald of Wales lectured to such scholars in 1188, and the first known foreign scholar, Emo of Friesland, arrived in 1190. The head of the University was named a chancellor from at least 1201, and the masters were recognised as a universitas or corporation in 1231. The university was granted a royal charter in 1248 during the reign of King Henry III. After disputes between students and Oxford townsfolk in 1209, some academics fled from the violence to Cambridge, later forming theUniversity of Cambridge. Aerial view of Merton College‘s Mob Quad, the oldest quadrangle of the university, constructed in the years from 1288 to 1378. The students associated together on the basis of geographical origins, into two “nations“, representing the North (Northern or Boreales, which included the English people north of the River Trent and the Scots) and the South (Southern or Australes, which included English people south of the Trent, the Irish, and the Welsh). In later centuries, geographical origins continued to influence many students’ affiliations when membership of a college or hall became customary in Oxford. In addition to this, members of many religious orders, including Dominicans,Franciscans, Carmelites, and Augustinians, settled in Oxford in the mid-13th century, gained influence, and maintained houses or halls for students. At about the same time, private benefactors established colleges to serve as self-contained scholarly communities. Among the earliest such founders were William of Durham, who in 1249 endowed University College, and John Balliol, father of a future King of Scots; Balliol College bears his name. Another founder, Walter de Merton, a Lord Chancellor of England and afterwards Bishop of Rochester, devised a series of regulations for college life; Merton College thereby became the model for such establishments at Oxford, as well as at the University of Cambridge. Thereafter, an increasing number of students forsook living in halls and religious houses in favour of living in colleges. In 1333–34, an attempt by some dissatisfied Oxford scholars to found a new university at Stamford, Lincolnshire was blocked by the Universities of Oxford and Cambridge petitioning King Edward III. Thereafter, until the 1820s, no new universities were allowed to be founded in England, even in London; thus, Oxford and Cambridge had a duopoly, which was unusual in western European countries. The new learning of the Renaissance greatly influenced Oxford from the late 15th century onwards. Among university scholars of the period were William Grocyn, who contributed to the revival of Greek language studies, and John Colet, the noted biblical scholar. With the Reformation and the breaking of ties with the Roman Catholic Church, Recusant scholars from Oxford fled to continental Europe, settling especially at the University of Douai. The method of teaching at Oxford was transformed from the medieval Scholastic method to Renaissance education, although institutions associated with the university suffered losses of land and revenues. In 1636, Chancellor William Laud, Archbishop of Canterbury, codified the university’s statutes. These, to a large extent, remained its governing regulations until the mid-19th century. Laud was also responsible for the granting of a charter securing privileges for theUniversity Press, and he made significant contributions to the Bodleian Library, the main library of the university. From the inception of theChurch of England until 1866, membership of the church was a requirement to receive the B.A. degree from Oxford, and “dissenters” were only permitted to receive the M.A. in 1871. The university was a centre of the Royalist party during the English Civil War (1642–1649), while the town favoured the opposing Parliamentarian cause. From the mid-18th century onwards, however, the University of Oxford took little part in political conflicts. Find peace…. Or let it find you…. It is the same …. Let Us Be In Peace.. Sometimes solution to tiredness is not resting but going out alone to a place where you can find peace…….. Sometimes all we need is to sit alone, introspect ourselves and give ourselves time…… Sometimes being thoughtless becomes more important than thinking of all the works we have to complete.. Because even machines need a break or else they break…. And we are not even machines even if we work like one…… We are humans…. 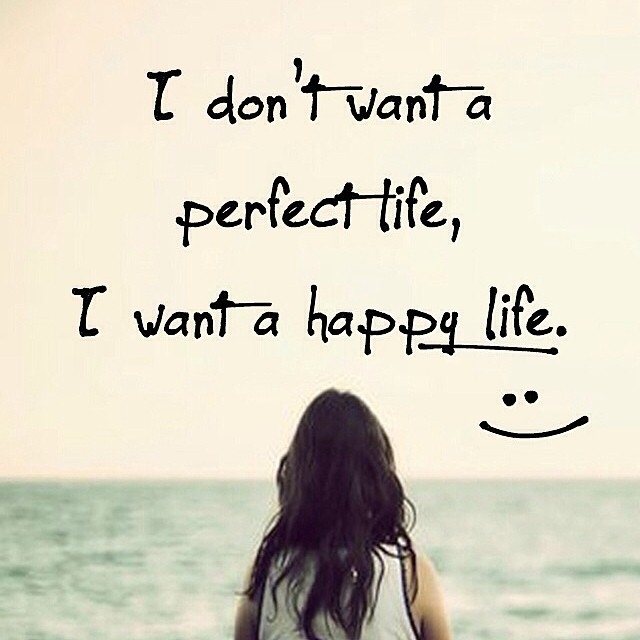 Give your life some free time….. We have the right to live stress free life… Let time heal you… Give life a break……. At least give some moments to yourself….. Follow me on my Bath Spa and surrounding area tips and tricks guide. From my couch, travel with me to Bath Spa, Avebury Stone Circle, Stonehenge, Lacock, Castle Combe and many other incredible locations you’ll never forget. I’d love to hear your adventures from Bath Spa. Follow me! How to Move to England…. Perhaps it’s always been your lifelong dream, or you just recently discovered your love for this country. Either way, you want to move to England. Unless you are a citizen of a European country, the requirements can be quite strict. This article will help you through the visa process, housing search, and more. Learn about visas. The United Kingdom government website has an easy online form that will tell you what type of visa you need. Check it out here. Most immigrants will need a visa of some kind, allowing them to live and possibly work in the UK for a certain amount of time. Once you know which type to apply for, get started atvisa4uk.fco.gov.uk. It’s best to allow several months for your visa to get approved. If you need more information, the rest of this section explains the immigration and travel requirements in detail. Otherwise, [#logistics|skip ahead] to the next section. The United Kingdom is the state made up of England, Scotland, Wales, and Northern Ireland. You do not need a visa specific to England. Know the rights of European citizens. If you are a citizen of any country in the European Economic Area (EEA), you have the right to live and work in the United Kingdom. This includes all countries in the European Union, plus Iceland, Lichtenstein, and Norway. Citizens of Switzerland also have this right. All you need is a passport to prove your citizenship. While not required, you may also want to apply for a registration certificate. This may help you prove your rights when applying for various benefits. Family members of European citizens who are not themselves citizens must still apply for a visa. They can apply for permanent residency after the citizen family member has worked in the UK for five years. Tier 2 visas are available for high-demand fields, listed in detail here. You may also have a chance if you are transferring within a multinational company, or if your employer can demonstrate that your job cannot be filled by a local worker. These usually allow three years of residency, extendable to six. Tier 5 visas are temporary work permits good for 6 months to 2 years. If you are not qualified for a Tier 2 position, look for work in a charity organization, or work as an athlete, entertainer, or religious worker. Tier 1 visas are only available to people starting a business, making multimillion pound investments, or recognized as leaders in their field. They’re typically good for five years and can be extended to ten. Enroll as a student in a UK institution. You must speak English and have enough money to support yourself. You can stay until you complete the course, plus a few months. You will only be able to work in jobs required by your coursework. Family (variable length and work status): Available if joining a spouse, fiancé(e), partner of two+ years, or child. Also available if you need to be cared for by a family member in the UK. UK ancestry visa (5 years, can work): Must be a Commonwealth citizen with a grandparent born in the UK. Tier 5 Youth Mobility (2 years, can work): citizen of certain countries, between 18 and 30. Visitor visa (usually 6 months, can’t work): A last resort. If you have the money to support yourself while waiting, you can arrive on a visitor visa, then try to get hired and apply for a worker permit. The odds are slim, but you get a vacation if it doesn’t work out. London prices are very expensive, averaging £1,900/month for a 2-bedroom flat (apartment). Consider other cities, or country towns within an hour of a city. Look closely — the listed rental price may be either weekly or monthly. Feel free to negotiate over the price. If you plan to buy a house, hire a real estate solicitor in the UK first. Utilities: Expect to pay about £120 a month for water and electricity, plus £70 for heating. This is the average cost over a year; heating costs are much higher during winter, and lower during summer. Council tax: at least £100 per month, but potentially much more. Television licence: In order to watch live BBC channels (even online), you need to pay £145.50 each year. Television, mobile, and Internet plans vary widely. This is in addition to the licence fee. Practice your English. If English is not your native language, start studying before you arrive. Life will be much easier if you can speak, read, and write in English. It may also be a requirement for some jobs, or for applying to become a permanent resident. Approved travel route and transport agency, listed here. If traveling from a hot climate, you may need to wait for cooler weather. Budget your expenses. Cost of living varies depending on your location. Use expatistan.com to compare your current location to your new home. If you stay in the UK more than 183 days, you will owe taxes on your income. Figure out transportation. Public transportation is reliable in London and most other large cities, while parking and gas prices are challenging. If you do decide to drive, click here to find out whether you can use your current licence. Train travel is common for longer trips, with price and speed ranging from convenient to absurd depending on the route. If you plan on traveling and are over 60 or under 25, buy a discount railcard. In London, buy an Oyster Card from a tube (subway) station. These give discounted prices on tube, bus, and city rail fares. Get an English banking account. A bank account and associated debit/credit card are usually free. A few of the largest English banks are Lloyds, HSBC, Barclay’s, and NatWest. Ask your current bank whether it has a “sister bank” program you can use while in the UK. You can try opening a bank account from overseas, but you may need to give a UK address. National Insurance Number. This is used for tax purposes, and required for employment. Call Jobcentre at 0345 600 0643 to apply. Passport photo (with UK specifications). These are available at grocery store photo booths for £6 or less. Learn about UK healthcare. Emergency medical care is free for all visitors. Hospital visits are free to most visitors, including anyone who paid a one-time healthcare surcharge when applying. For other medical care, it’s up to the doctor whether to charge you. You may want to ask several doctors in your area about prices before you choose one. The pound sterling (symbol: £; ISO code: GBP), commonly known simply as the pound, is the official currency of the United Kingdom, Jersey, Guernsey, the Isle of Man, South Georgia and the South Sandwich Islands, the British Antarctic Territory, andTristan da Cunha. It is subdivided into 100 pence (singular: penny). A number of nations that do not use sterling also have currencies called the pound. At various times, the pound sterling was commodity money or bank notes backed by silver or gold, but it is currently fiat money, backed only by the economy in the areas where it is accepted. The pound sterling is the world’s oldest currency still in use and which has been in continuous usage since its inception. The British Crown dependencies of Guernsey and Jersey produce their own local issues of sterling: “Guernsey pound” and “Jersey pound“. The pound sterling is also used in the Isle of Man (alongside the Manx pound), Gibraltar (alongside the Gibraltar pound), the Falkland Islands (alongside the Falkland Islands pound), Saint Helena and Ascension Island in Saint Helena, Ascension and Tristan da Cunha (alongside the Saint Helena pound). The Bank of England is the central bank for the pound sterling, issuing its own coins and banknotes, and regulating issuance of banknotes by private banks in Scotland and Northern Ireland. Banknotes issued by other jurisdictions are not regulated by the Bank of England; local governments use Bank of England notes as backing for local issuance by allowing them to be exchanged 1:1 at face value. Sterling is the 4th most traded currency in the foreign exchange market, after the United States dollar, the euro, and the Japanese yen. Together with those three currencies it forms the basket of currencies which calculate the value of IMF special drawing rights, with an 11.3% weighting as of 2011 (USD 41.9%, Euro 37.4%, Yen 9.4%). Sterling is also the 3rd most held reserve currency inglobal reserves (about 4%).